Funeral Services for Syble Gooden were Friday, July 7 at 10 a,m, at Hickory Grove Congregational Methodist Church in Robeline with the Rev. Brian Jennings officiating. Interment followed at Hickory Grove Cemetery. Syble Christene Gooden, 87, of Natchitoches went to her heavenly home July 4, 2017. She was born in Robeline April 13, 1930, to Mary and Tomy Gooden. 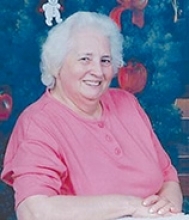 Syble was a loving and caring lady, always dedicating her time to her church, Hickory Grove, serving as treasurer of the church, working Vacation Bible Schools or teaching Sunday School classes; she helped wherever she could. She was treasurer of the Hagewood Water System for many years. Although she never had children of her own, she helped raise her sisters, nieces and nephews, and great nieces and nephews, always playing a major role in all of their lives. She did everything with a smile on her face and a depth of love that will never be forgotten. She will be greatly missed by all who knew her. She is survived by two sisters, Mary Jane Gooden Margiotta and Doris Gooden Williams; and many nieces and nephews, great nieces and nephews and great-great nieces and nephews. She was preceded in death by her parents, Tomy Gooden and Mary White Gooden; and siblings, Retha Gooden, Ruby Gooden, W.J. Gooden, A.J. Gooden and Huey P. Long Gooden. Those honored to serve as pallbearers include Paul Gooden, Jerrell Gooden, Adrian Gooden, Jesse Gooden, Wayne Gooden, Josh Gooden and Chris Gooden. Honorary pallbearers include Paul Culberth and Carl Upchurch. Next articleREV. JERALD RAY GANT SR.